This Apple and Cinnamon Cake Recipe creates a wonderfully light and tasty cake. It is a nice and somewhat slightly healthier option to a traditional cake with a butter cream filling. With two apple trees in the garden, there is always a supply of apples stored in the garage or stewed in the freezer. This recipe is a change from the usual crumble or Eves Pudding I usual turn to, to use up the stewed apples I have stored in my freezer. Beat the butter and sugar together, until light and fluffy. Gradually add the beaten egg, add a little flour if needed to prevent the eggs and butter from separating. Add the cinnamon to the flour, then carefully fold this into the cake mix. Split the mixture between two 7inch round cake tins that are lined and greased with a little butter. Bake for 20 minutes 180 degrees C or gas 4. Whilst the cake is in the oven you can stew the apples. Peel and core approximately 7 apples, depending on size. Cut up the apples and place in a saucepan with 3-4 tablespoons of sugar and a splash of water. Simmer until softened, taste and add more sugar if needed or more water, but you want it quite thick. Add half a teaspoon of cinnamon and the raisins if you wish. Stir. Once the cake and the stewed apples have both cooled, generously spread the apple on one of the sponge cakes to sandwich the two together. Decorate the top with a light sprinkling of icing sugar and cinnamon. I like to think of this as a slightly lighter in fat cake than normal, there is no thick layer of butter cream sandwiching the cake together - just lovely fruit. The cake was shared with my aunt to celebrate her 81st birthday! *any leftover stewed apples goes great with natural yogurt and granola for breakfast, or pop it in the freezer. This recipe has been adapted from the basic sponge recipe in the Great British Bake Off book. I agree with you that swapping buttercream filling for delicious stewed apples definitely makes this a healthy cake! Will do this more often with other fruit too, tasted fabulous! Oh that looks so good. 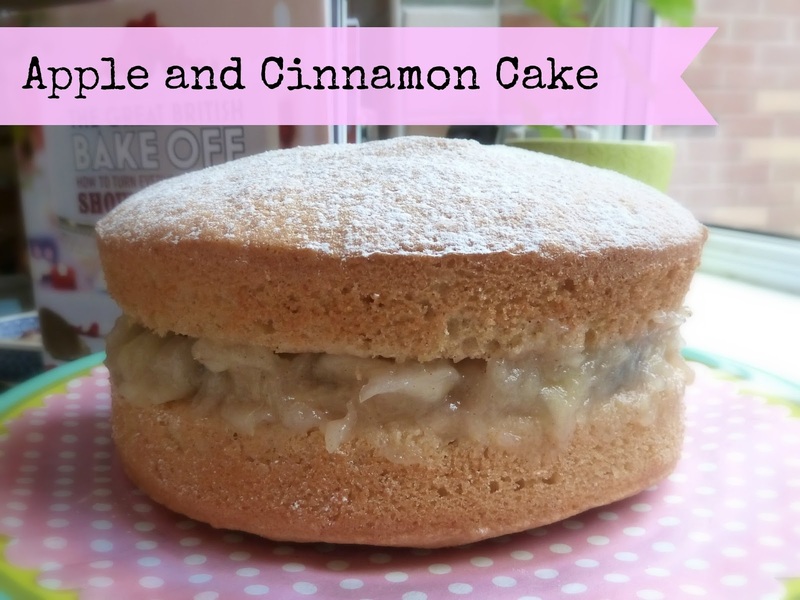 I love a good apple cake and cinnamon is my favourite spice. I've used apples like this to sandwich a cake together before and it works really well. The apples were the real winner in this cake - just lovely! Love the idea of using stewed apple for the filling - I love apple cake anyway! What a good idea using stewed apples for a filling! Not so naughty and very nice!